Japan's tour bus-sized Kibo laboratory module (right) is moved into position on the side of the International Space Station during its June 3, 2008 delivery by STS-124 astronauts. Thisstory was updated at 1:39 p.m. EDT. HOUSTON ?Astronauts aboard the International Space Station (ISS) appeared to solve theorbiting lab?s toilet troubles Wednesday as they prepared to open a newJapanese laboratory for business. Spacestation flight engineer Oleg Kononenkoreplaced a failed pump in the station?s Russian-built commode in a fix thatrestored the space toilet?s ability to collect liquid waste. ?I see airflow right away,? Kononenkosaid after activating the system, which uses flowing air in place of gravity to collect waste in weightlessness. Threeinitial tests of the system appeared to be successful, with Russian engineersgiving the station crew the go ahead to use the repaired toilet for now andreport on its status. ?Okay, let?s start using it,? Russian flight controllers told Kononenko aftertwo and a half hours of work. Built intothe station?s Russian Zvezda service module, thespace toilet went on the fritz about 10 days ago. Station astronauts were ableto make partial repairs, though the fix required extra flush water andtime-consuming overhauls every three uses, mission managers said. ?It?sunfortunate that we?re talking about toilets, but that really is the life andthe future of human exploration in space,? said Kirk Shireman, NASA?s deputystation program manager, of today?s space toilet surgery. Even in space, thesame mundane maintenance jobs found on Earth are required, he added. NASAmission managers added a last-minutespare pump to Discovery?s cargo list before the shuttle?s May 31launch so astronauts could try once more to repair the seven-year-old toilet.They also included extra liquid waste receptacles in case the fix should fail. ?We usethese primarily for research purposes, but we can use those for everyday use ifyou will,? said Shireman, adding that with Discovery?s delivery, the stationhas enough bathroom supplies to last until the next Russian cargo shipmentlater this summer. Commandedby veteran spaceflyer Mark Kelly, Discovery?s seven-astronaut crew is in themiddle of a 14-daymission to deliver Japan?s giant Kibo laboratory, fix the station?s toiletand swap out one crewmember aboard the orbital outpost. Latertoday, Discovery astronauts are expected to christen the station?s new tourbus-sized Kibo laboratory, a $1billion new lab installed during a Tuesday spacewalk. The spaceflyers willcheck their shuttle?s heat shield inspection boom, which was retrieved from astorage berth on the ISS during yesterday?s spacewalk, today to ensure it?s inworking order. ?We have anew 'hope' on the International Space Station,? said astronaut Akihiko Hoshideof the Japan Aerospace Exploration Agency (JAXA) after helping install the newKibo lab (whose name means ?hope? in Japanese) on Tuesday. Hoshide andhis crewmates are scheduled to open the Kibo lab for business today at about4:52 p.m. EDT (2052 GMT) today. At 37 feet(11 meters) long and 14.4 feet (4.4 meters) wide, Japan?s Kibo laboratory isthe largest single room ever launched to the ISS and is only one of threesegments that make up the station?s entire Japanese space research facility. Itis designed to host a wide variety of internal and external experiments tostudy fluid physics, materials science and astronomy. ?We?reextremely happy to see the Kibo pressurized module attached to its permanentlocation,? JAXA?s deputy Kibo operations project manager Tetsuro Yokoyama saidTuesday. The32,000-pound (14,514-kg) Kibo module follows an attic-likestorage room, which astronauts delivered to the station in March, andincludes two small windows, an airlock and a robotic arm at one end to accessan external platform slated to launch next year. A control center in TsukubaSpace Center, just north of Tokyo in Japan, will oversee the Kibo facility fromEarth. Hoshidetold SPACE.com before Discovery?s May 31 launch that he would likelyopen the new module with some sort of speech, though what he planned to say wasstill up in the air. Yokoyamasaid he expects Japanese station flight controllers and engineers will befairly busy during the module?s activation today, but there is an air ofanticipation as well. ?We will bewaiting,? Yokoyama said. NASA isbroadcasting Discovery's STS-124 mission live on NASA TVon Saturday. 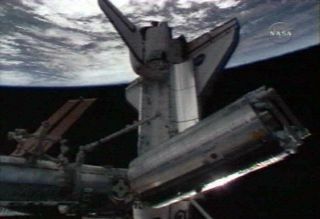 Click here forSPACE.com's shuttle mission updates and NASA TV feed.